University of Otago department of zoology Prof Phil Seddon (left), Valley Project community development co-ordinator Anna Parker, and Orokonui Ecosanctuary educators Clare Cross and Tahu Mackenzie will collaborate to establish an education programme to entice kaka back to areas in Northeast Valley, including Chingford Park. Photo: Peter McIntosh. A $20,000 grant could help coax kaka and other native birds back to Northeast Valley gardens. 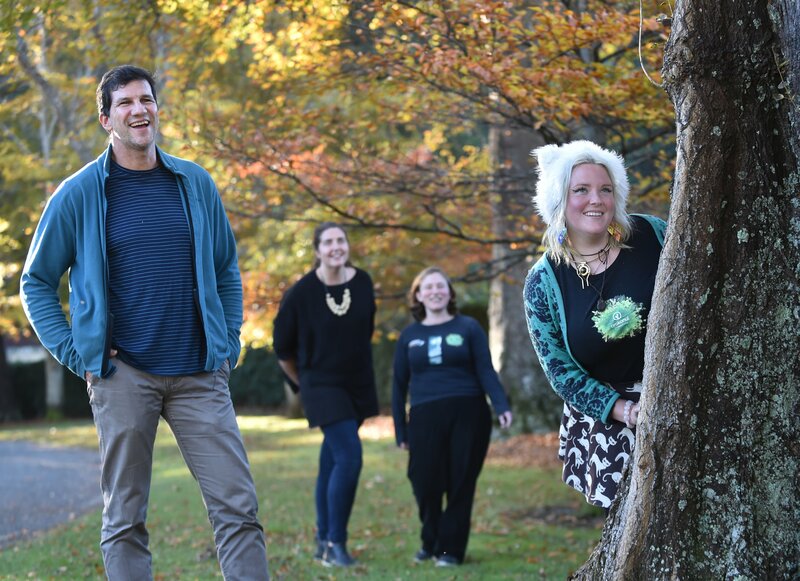 The government-funded Curious Minds grant will enable Orokonui Ecosanctuary staff to work with the University of Otago department of zoology to create a scientific programme for schools in the area to monitor bird and predator life. Northeast Valley resident Eleanor Linscott came up with the idea for the project after thinking about how birds leaving Orokonui Ecosanctuary could be encouraged to inhabit Northeast Valley. With the support of the Valley Project, she applied for a Curious Minds grant. Prof Phil Seddon, of the zoology department, said it would be the first time a whole Dunedin suburb worked together on a predator-free project. Pupils at five schools would work with Orokonui Ecosanctuary educators to monitor birds and predators in their backyards before reporting back to the community at a series of meetings. Pupils’ observations would be recorded on the online nature monitoring platform Nature Watch so people all over the world could follow the project. Ecosanctuary educator Clare Cross said she hoped the project would inspire children to engage in science and realise everyone had the ability to make their backyards safe places for native birds. Motion-sensor cameras and tracking footprints would be used to monitor predators in pupils’ backyards during the six-month project.Ecosanctuary educator Tahu Mackenzie said the project would help establish a safe environment for birds leaving the ecosanctuary, including kaka. The project was the first step in creating an open urban ecosanctuary in Northeast Valley. Attracting kaka back to Northeast Valley treetops would not happen overnight, she said. "Orokonui has a 1000-year plan and we want to encourage other community groups to have a similar long-term view." The children and grandchildren of Northeast Valley pupils would likely be the ones to spot kaka living in the neighbourhood. Valley Project community development co-ordinator Anna Parker said the group would seek feedback on how predators in the area could be managed, so the suburb could be filled with native wildlife. Schools would begin working on the project later this term. A public meeting would be held at 7pm on Thursday in the Valley Project community rooms, at 262 North Rd.